THE B-MOVIE NEWS VAULT: New DVDs & Blu-rays for 06/07/2016! New DVDs & Blu-rays for 06/07/2016! Welcome to June Vault Dwellers! 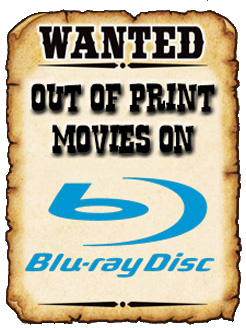 Summer is almost here and many of us will be spending more time outdoors (and at the multiplex), but that isn't stopping DVD & Blu-ray distributors from cranking out some cool stuff! Though there isn't a lot to be excited for this week, there are still some quality titles you may want to add to your collection! Scream Factory gives us two new releases this week, namely THE ABANDONED, and THE FUNHOUSE MASSACRE! GHOSTBUSTERS and GHOSTBUSTERS II both make their Ultra 4K debuts, there's a ton of new anime titles now available (PSYCHO-PASS: THE MOVIE, MOBILE SUIT GUNDAM ZZ, et al. ), and various bargain-priced DVD boxed sets full of classic Horror and Sci-Fi titles! Scroll on down to see the full roster of this week's new releases! Contains: Slipstream, To Survive, Night Train to Terror, The Devil's Messenger, and Rise of the Undead. Contains: Dragon Wars, She Creature, The Day the World Ended, Anaconda, and The Cave. Buckets of Blood: 25 Movie Collection - View contents HERE. Killer Creature Features: 50-Movie Mega Pack - View contents HERE. Mad Scientist Theatre: 50-Movie Mega Pack - View contents HERE. Midnite Movie Madness: 50-Movie Mega Pack - View contents HERE. Monsters Attack: 25-Movie Collection - View contents HERE. Nightmare Fuel: 20-Movie Collection - View contents HERE. Contains: Wind Chill, DeVour, Insanitarium, The Plague, and Vinyan. Savage Predators: 20-Movie Collection - View contents HERE. New DVDs & Blu-rays for 06/28/2016! New DVDs & Blu-rays for 06/21/2016! New DVDs & Blu-rays for 06/14/2016! New DVDs & Blu-rays for 05/31/2016!